Ministry has allowed me to cook up lots of wonderful things. Here you’ll find some of the ideas and resources of which I’m particularly proud and eager to offer to support and nurture other communities of faith. These daily devotions through the blue days of Advent don’t leap into Christmas hope but wander through the aching and longing echoed through sacred scripture. Written from my own experience of loss, these words invite the grieving and brokenhearted to notice that God is here. These tender and honest words aren’t for those that believe that this is the most wonderful time of year, but are instead written with love for those for whom this time of year is very, very hard. Most of us don’t know how to begin to pray — and far too many are looking for the perfect practice or method. But, there no such thing. Prayer Partners is a friend who will join you on the journey – who will encourage you and nudge you when you’re not doing the things you said you needed. It’s someone that will laugh and cry with you in prayer. It’s someone to talk to about what it means to be a Christian in a changing world. It’s not a method but a relationship. This resource seeks to guide individuals, pastors and others looking to partner in prayer through the the journey of partnering in prayer. Do You Have An Idea for a Small Group Ministry? In eight simple steps, this generic outline provides a simple how to for any lay person to begin to imagine and lead their own small group ministry. Starting with an idea, it lays the groundwork toward realizing growth and renewal for a new group within the life of any congregation. Move toward transformation by choosing one thing — just one thing — in your life that you want to change. In this six-week study, following the readings from the Book of Psalms in Year A of the Revised Common Lectionary, you’ll move through the wide array of human emotion in the Psalms as you realize the power of Resurrection in your very own body. 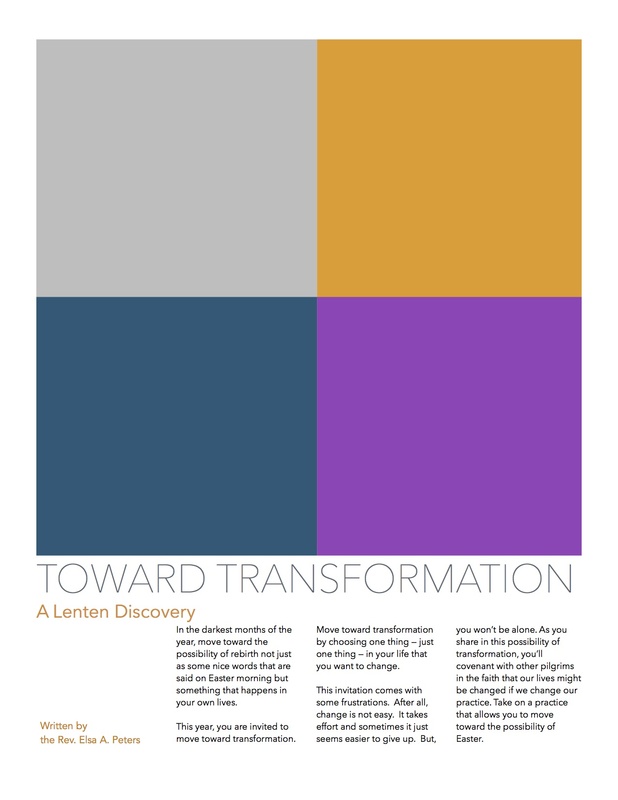 This is a wonderful opportunity for a group within or outside of a congregation to find greater connection with their own bodies, each other and God during the Season of Lent. That last title is something I wrote! 52 reflections for the 52 weeks of advocacy in a year inspire and challenge to continue in the struggle. A sample can be found here.